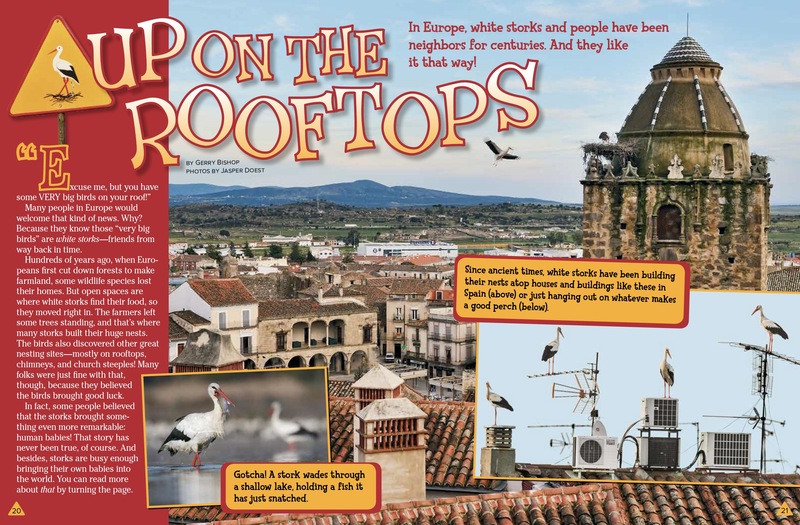 In Europe, white storks and people have been neighbors for centuries. And they like it that way! Many people in Europe would welcome that kind of news. Why? Because they know those “very big birds” are white storks—friends from way back in time. Hundreds of years ago, when Europeans first cut down forests to make farmland, some wildlife species lost their homes. But open spaces are where white storks find their food, so they moved right in. The farmers left some trees standing, and that’s where many storks built their huge nests. The birds also discovered other great nesting sites—mostly on rooftops, chimneys, and church steeples! Many folks were just fine with that, though, because they believed the birds brought good luck. In fact, some people believed that the storks brought something even more remarkable: human babies! That story has never been true, of course. And besides, storks are busy enough bringing their own babies into the world. Big nests take a lot of work to build. But they can last a long time. Whenever possible, stork parents use the same nest for many years, adding more sticks to it each season. Over time, a nest can reach the size of a bathtub and weigh more than 500 pounds! Soon after mating, a female stork lays three to five white eggs. She and her mate take turns sitting on the eggs for a little over a month. Then the eggs begin to hatch—and the really hard work begins. While one parent stays with the chicks, the other goes off in search of food. The “food searcher” stalks slowly through pastures, fields, marshes, and shallow ponds and lakes, looking for anything that moves. Insects and earthworms are favorites, but a stork will also grab frogs, lizards, mice—even scorpions and snakes. It swallows the food it catches. And when its belly is full, it flies back to the nest and throws up the food. The hungry little storks gobble down each meal as fast as the parents can bring it. The chicks grow from just a few ounces to almost eight pounds in only six weeks. Their stubby black bills become long and red, and their fluffy down gives way to white and black feathers. Two months after hatching, they’re ready to take their first flights. Every fall, after the babies have grown up, many white storks migrate to wintering grounds. Some of the storks that migrate don’t travel very far at all, but some go all the way to southern Africa—up to 9,000 miles away! In spring, the migrating storks make the same trip back again. 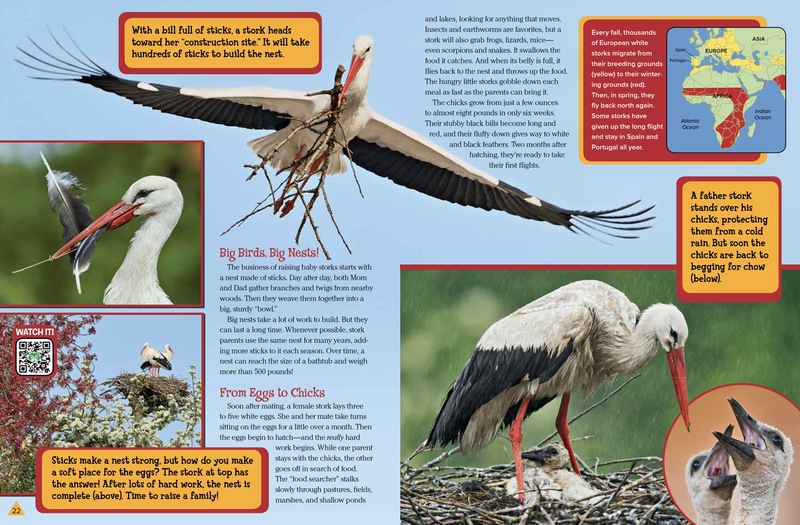 People all over Europe welcome the storks as they return for the nesting season. For hundreds of years, storks thrived in Europe. The big birds found plenty of food in the pastures that farmers had created. Nearby marshes and other wetlands were also good hunting places. But in the late 1800s and early 1900s, things began to change. Farmers plowed up too many of the grassy pastures to make fields for growing crops. They also began using pesticides (pest-killing chemicals), which poisoned some of the storks’ prey. Marshes were drained of water to create still more cropland. Soon, many small animals that the storks fed on disappeared. And without enough food, the number of storks began to fall. The storks were having other problems, too. People were putting up more and more electric poles and lines. Some storks were killed by crashing into the lines. Others nested on the poles and were electrocuted by accidentally touching two wires at the same time. Towns were growing into cities, taking over the open spaces that storks needed. And in Africa, droughts and pesticides were killing creatures that the storks fed on in winter. To help the storks make a comeback, people wanted to do all that they could. They cut down on the use of pesticides and began to create new habitat. They began raising storks in captivity and then releasing them into the wild. This helped more young storks survive and go on to have babies of their own. People also fixed electric poles and lines so fewer storks would be harmed by them. And they put up tall poles where storks could nest in safety. Soon the numbers of storks began to grow. This was great news for all those who had worked to save them. As the storks became more plentiful, some began finding food in new places: garbage dumps in southern Europe. The storks began stopping at the dumps on their migration to Africa. And now thousands of them are staying there all winter long. 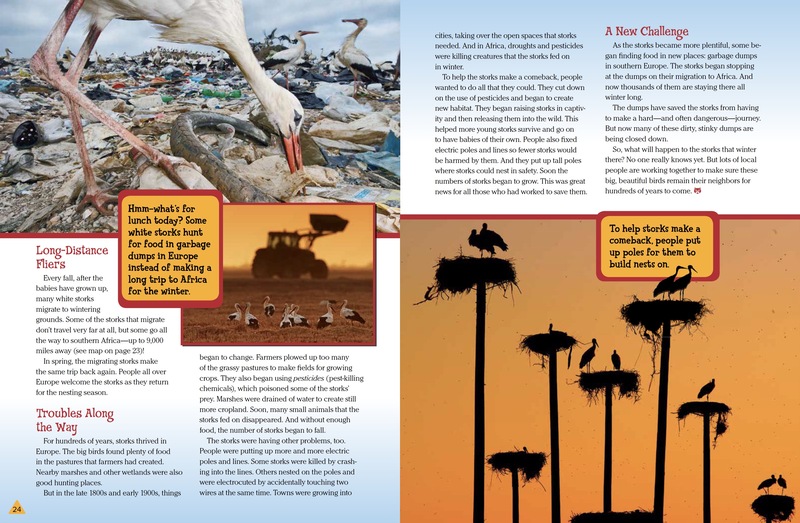 The dumps have saved the storks from having to make a hard—and often dangerous—journey. But now many of these dirty, stinky dumps are being closed down. So, what will happen to the storks that winter there? No one really knows yet. But lots of local people are working together to make sure these big, beautiful birds remain their neighbors for hundreds of years to come. “Up on the Rooftops” originally appeared in the September 2017 issue of Ranger Rick magazine.